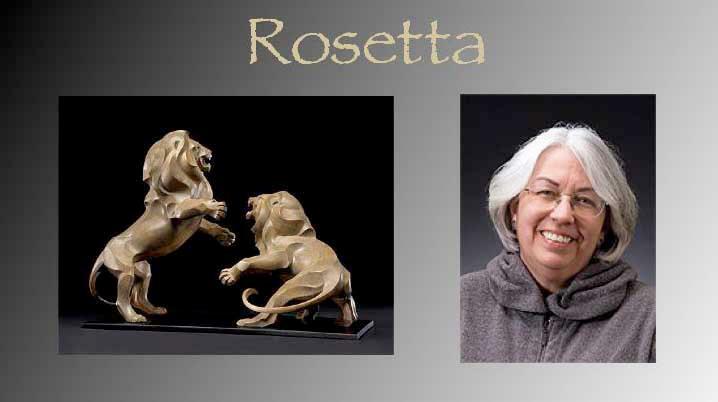 Though drawn to modeling in clay at a very young age, Rosetta's formal art training was in commercial art, culminating at the Art Center College of Design in Los Angeles. It wasn’t until computers put an end to my successful 17-year free-lance career, designing and hand-lettering for logos and packaging in the San Francisco Bay area, that I realized that I could actually make sculpture a career. Now I create sculptures of animals. They depict the life force of the animal, in all of its visual splendor, rather than a realistic depiction of outward appearances. Although I keep the animal’s basic form true to reality, it is my interpretation of that form, motion and inner spirit that is my art. Though I work directly in clay without preliminary drawings, I use line, released from two dimensions into three, to express the beauty, grace and power I see in the animal form. I call this “Interpretive Realism”. A childhood spent in Papua New Guinea and a lifelong love of wildlife were the twin catalysts for Peta's commitment to her art. Peta's love of caring for some of the smaller species of birds is also reflected in her art. 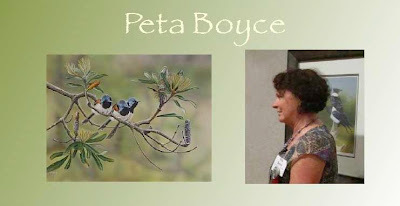 A self-taught artist, working mainly in gouache, her paintings of wrens, finches, robins and the smaller honeyeaters are extremely popular and her work is in private collections both in Australia and overseas.Passionate about Australian Native flora and fauna, Peta will take any opportunity to educate and inform others of the beauty in Australia and has spent many hours at the local school talking with the children. A keen gardener, she has planted most of the acreage that she lives on with Australian native plants. Many of the plants are endemic to the area in an attempt to "bring back the wildlife".